Premium cosmetics manufacturers have been focused on innovative ingredients to suit every aspect of beauty wellness with a natural alliance of art and craftsmanship, led by creativity, virtuosity and quality of the product. Premium cosmetic products have been one of the major categories in the analysis of the top luxury goods across the world. Luxury cosmetics covered 13.9% revenue share from global luxury goods in 2016. As compared to 2015, there has been 13.4% hike in the global sales of the premium cosmetics in the FY2016. The reason behind the surge in sales is the high demand for developing economies. Major players in Middle East region are looking forward to expand their business horizons in Central Asia and Africa. Cosmetic companies in UAE are keen on expanding into high demand and consumer markets across the globe. Compared to developed regions, growth rate of sales is higher in developing regions such as India, China, and Brazil. Goldstein Research analyst forecast the premium cosmetics market size is expected to cross USD 369.2 billion by 2024 from USD 127.0 billion in 2016, expanding at a CAGR of 14.2% over the forecast period i.e. 2016-2024. Luxury cosmetic companies are increasing their focus on the quality of the cosmetics and promoting luxury experience with personalized customer in-store and online experience. Global sales of premium beauty products are expected to showcase a double digit growth over the next five to six years. 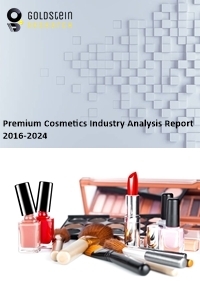 The report covers the present ground scenario and the future growth prospects of the premium cosmetics market for 2016-2024 along with the statistics of the total shipments of the premium cosmetics and its adoption rate in various countries. We calculated the market size and revenue share on the basis of revenue generated from major players. We have forecast the market on the back of parameters including industry trend, consumer spending trend, growth rate of cosmetic industry, R&D by manufacturers, expansion of global players. On the basis of product type, skin care products segment owns the largest market share of 28.9% in 2016 due to rising inclination of consumers towards beauty and wellness as per the fashion trends. On the other hand, Offline distribution channel generated major market share of 56.8% in 2016 due to the preference of high income quintile to shop at flagship or specialty stores. Premium cosmetics platform such as Sephora, French chain of cosmetic stores, are gaining traction among the high income consumers. However, online shopping is also one of the growing trends which help the luxury cosmetics industry to grow over the upcoming years. Premium cosmetics market outlook 2016-2024, has been prepared based on an in-depth market analysis from industry experts. The report covers the competitive landscape and current position of major players in the premium cosmetics. The report also includes porter’s five force model, SWOT analysis, company profiling, business strategies of market players and their business models. Global premium cosmetics report also recognizes value chain analysis to understand the cost differentiation to provide competitive advantage to the existing and new entry players. According to our global premium cosmetics market study on the basis of extensive primary and secondary research, there is growing consumer trend of ‘less is more’, that focuses on beauty can be reinvented with healthy living, premiumisation, experience, green living and connectivity at its heart. This has led to cosmetic manufacturers to undergo innovations to bring out the products with essential benefits. The trend in developed nations has infiltrated from spirits and liquors to fashion and beauty. Consumers in high income countries such as UAE, Kingdom of Saudi Arabia and others are willing to pay more for higher quality. In 2016, consumers in UAE spent USD 1.72 billion on beauty products. According to the report, global beauty and personal care industry players are expanding their businesses or increasing the supply in large consumer markets such as India, South of Russia, West Africa, East Africa, China and others. This will lead to increase the number of flagship stores and supply of premium cosmetic products into the market. Entry of new players in developing nations will increase the competitiveness into the market which caters to the buyers to get good discounts and offers on premium cosmetic products. However, digitalization is one of the major challenges for the industry players which are pushing them towards the entirely new business model. The drop off in flagship stores growth, where one store per week was the store opening rate, has now shifted the market players towards e-commerce platforms. Most of the industry players recognize the high potential of the digital shopping industry and rising trend of e-commerce. Nowadays, premium brands are more cautious about opening new flagship stores as the return on investment (ROI) is going low. Based on geography, Europe dominate the global premium cosmetics market with a revenue share of 32.1% in 2016. France, Germany, Italy, Switzerland, Spain and the U.K. were the top countries globally for their sales of luxury goods. Europe is growing due to presence of fashion capital and presence of many premium brands, along with the high per capita income countries. On the other hand, Asia Pacific region is one of the fastest growing market place across the globe on the back of huge consumer base. However, brands are realizing that, in Asian countries, they will face rural and under developing nations with high population growth. While Middle East and Africa is the fastest and the most opportunistic market place for the premium cosmetic brands owing to high income population and luxury lifestyle in the region. Global premium cosmetics market report comprises of the following companies as the key players in the premium cosmetics: Coach, LVMH, Puig, Shiseido, The Estée Lauder Companies Inc., Ralph Lauren Corporation, L’Oréal, Coty, Revlon, Hermès. Other high-flying vendors in the premium cosmetics market are: Azzaro, Carolina Herrera, Groupe Clarins SA, Oriflame, GIVI Holding S.p.A., Christian Louboutin S.A., Bottega Veneta, Balmain. What is the revenue of global premium cosmetics market in 2015-16 and what would be the expected demand over the forecasted period?